Hydrolyzed Whey Protein Isolate, Micronized Branched Chain Amino Acids, (L-Leucine, L-Isoleucine, L-Valine), Cocoa (Processed with Alkali), Natural And Artificial Flavor, Lecithin, Salt Substitute (Salt, Sodium Gluconate, Potassium Chloride), Cellulose Gum, Sucralose, Acesulfame Potassium, Enzyme Blend (Aminogen®, Amylase, Protease, Cellulase, Lactase, Lipase). INGREDIENTS: Hdrolyzed Whey Protein Isolates, Micronized Branched Chain Amino Acids (L-Leucine, L-Isoleucine, L-Valine), Cocoa (Processed with Alkali), Natural and Artificial Flavors, Lecithin, Contains 1.5% or Less of: Creamer (Sunflower Oil, Maltodextrin, Modified Food Starch, Dipotassium Phosphate, Tricalcium Phosphate, Tocopherois), Salt, Cellulose Gum, Potassium Chloride, Sucralose, Vanillin, Acesulfame Potassium, Enzyme Blend (Aminogen, Amylase, Protease, Cellulase, Beta D-Galactosidase, Lipase). Hydrolyzed Whey Protein Isolates, Micronized Branched Chain Amino Acids (L-Leucine, L-Isoleucine, L-Valine), Cocoa (Processed with Alkali), Natural and Artificial Flavors, Contains 1.5% Or Less Of: Soy Lecithin, Salt Substitute (Salt, Sodium Gluconate, Potassium Chloride), Cellulose Gum, Sucralose, Acesulfame Potassium, Enzyme Blend (Aminogen®, Maltodextrin, Amylase, Protease, Cellulase, Beta-D-Galactosidase, Lipase). Hydrolyzed Whey Protein Isolates, Micronized Branched Chain Amino Acids, (L-Leucine, L-Isoleucine, L-Valine), Cocoa (Processed With Alkali), Natural And Artificial Flavors, Lecithin, Contains 1.5% Or Less Of: Creamer (Sunflower Oil, Maltodextrin, Modified Food Starch, Dipotassium Phosphate, Tricalcium Phosphate, Tocopherols), Salt, Cellulose Gum, Potassium Chloride, Sucralose, Vanillin, Acesulfame Potassium, Enzyme Blend (Aminogen®, Maltodextrin, Amylase, Protease, Cellulase, Beta-D-Galactosidase, Lipase). Hydrolyzed Whey Protein Isolate, Micronized Branched Chain Amino Acids (L-Leucine, L-Isoleucine, L-Valine), Natural And Artificial Flavors, Soy Lecithin, Sunflower Powder (Sunflower Oil, Maltodextrin, Modified Food Starch, Dipotassium Phosphate, Tricalcium Phosphate, Tocopherols), Salt, Cellulose Gum, Acesulfame Potassium, Sucralose, Enzyme Blend (Aminogen®, Maltodextrin, Amylase, Protease, Cellulase, Beta-D-Galactosidase, Lipase). Hydrolyzed Whey Protein Isolate, Micronized Branched Chain Amino Acids, (L-Leucine, L-Isoleucine, L-Valine), Cocoa (Processed with Alkali), Natural And Artificial Flavor, Lecithin, Creamer (Sunflower Oil, Maltodextrin, Modified Food Starch, Dipotassium Phosphate, Tricalcium Phosphate, Tocopherols), Salt, Cellulose Gum, Sucralose, Enzyme Blend (Aminogen®, Amylase, Protease, Cellulase, Lactase, Lipase). Hydrolyzed Whey Protein Isolate, Micronized Branched Chain Amino Acids, (L-Leucine, L-Isoleucine, L-Valine), Natural And Artificial Flavor, Cookie Crumbs (Enriched Flour [Wheat Flour, Niacin, Reduced Iron, Thiamin Mononitrate, Riboflavin, Folic Acid], Sugar, Palm and Palm Kernel Oil Blend, Cocoa (Processed with Alkali), High Fructose Corn Syrup, Corn Flour, Salt, Dextrose, Sodium Bicarbonate, Soy Lecithin), Lecithin, Creamer (Sunflower Oil, Maltodextrin, Modified Food Starch, Dipotassium Phosphate, Tricalcium Phosphate, Tocopherols), Salt, Cellulose Gum, Sucralose, Acesulfame Potassium, Enzyme Blend (Aminogen®, Amylase, Protease, Cellulase, Lactase, Lipase). Hydrolyzed Whey Protein Isolate, Micronized Branched Chain Amino Acids, (L-Leucine, L-Isoleucine, L-Valine), Natural And Artificial Flavor, Cocoa (Processed with Alkali), Lecithin, Cellulose Gum, Salt, Sucralose, Red 40, Enzyme Blend (Aminogen®, Amylase, Protease, Cellulase, Lactase, Lipase). Hydrolyzed Whey Protein Isolate, Micronized Branched Chain Amino Acids, (L-Leucine, L-Isoleucine, L-Valine), Natural And Artificial Flavor, Lecithin, Creamer (Sunflower Oil, Maltodextrin, Modified Food Starch, Dipotassium Phosphate, Tricalcium Phosphate, Tocopherols), Salt, Cellulose Gum, Citric Acid, Malic Acid, Beet Color, Acesulfame Potassium, Sucralose, Enzyme Blend (Aminogen®, Amylase, Protease, Cellulase, Lactase, Lipase). For added effectiveness, we've also enhanced this revolutionary formula with micronized branched chain amino acids (BCAAs). 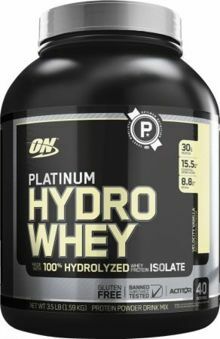 In addition to being fast, Platinum Hydrowhey is also ultra-pure. That's because it's made entirely with hydrolyzed whey protein isolates. So there's no excess fat or cholesterol to slow down your progress.